In a recent youtube presentation of Linaro's optimization over Android 4.0.4, Linaro Android Engineer Bernhard Rosenkränzer demonstrates that Android can perform twice as fast according to various OPENGL benchmarks. Benchmarks have shown framerates jump from 30 FPS (stock Android 4.0.4) to 60 FPS (Linaro Android 4.0.4). More recently, the Linaro Toolchain has been coded and merged in to the CyanogenMod ROM according to recent documents filed on reddit. For the time being, the Linaro optimizations can be used on stock/pure Android devices such as the Samsung Galaxy Nexus and the Nexus S.
Famed Android kernel developer, Francisco Franco, has also implemented Linaro in to his experimental Franco Linaro Kernel build for the Galaxy Nexus. XDA users and testers of his kernel build have cited huge performances gains and increases in benchmark scores. 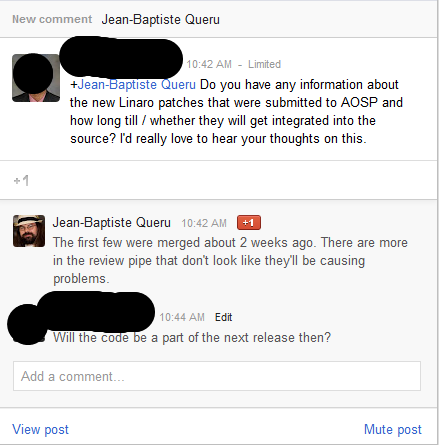 Google's well-known software engineer, Jean-Baptiste Queru has already been cited on his own Google+ page, as receiving parts of the Linaro Toolchain and merging them in to the official Android AOSP. With that being said, we may very well see the Linaro enhancements as early as Jellybean and then beyond.